Highest efficiency, highest performance and highest quality magazine in the industry. Quick-width adjustment, Lightest magazine in the industry. The unique ‘smart rack’ keeps cardguides absolutely parallel while providing excellent rigidity. Can accommodate PCB width of 20mm-460mm, and heated PCBs after PB free process. Ideal for stock reduction and save space for your factory. 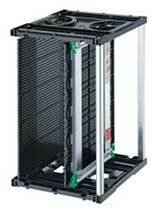 Ideal for Transportation from SMT line to inspection, assembly process. Available for Saving space magazine, Heat-resistant magazine or Tray for electoronic device that are derived from on-site require. 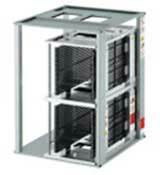 Rack width can be adjusted with the base cover attached. Magazine rack with exceptional accuracy for high quality. Enables easy and accurate width adjustment. Continuous parallel movement system (rack and pinion) for width adjustment in just five seconds. Cardguide construction that can handle heated PCBs after reflow enables two types of magazine racks (135°C and 165°C types). Note: These withstand temperatures do not apply to the entire magazine rack. Magazines should not be placed in the oven. Compatible with standard specifications of SMT equipment manufacturers. Note: Be sure to check your specifications upon ordering. Quick-width adjustment and lightest magazine in the industry. Unparalleled delivery performance with superior accuracy and quality without distortion. Standard equipped with one-touch PC Ramp. Four guide channels (supports) (S and M size). Standard equipped for L and large sizes. Able to accommodate PCB widths from 20 mm to 460 mm. Cardguides have five separate vertical sections to prevent expansion or contraction due to changes in temperature between upper and lower levels. Additional clearance between the cardguides and aluminum hat plate and the construction to absorb expansion and contraction due to heat eliminate the need to attach screws, thereby preventing stress and deformation of the cardguides. Note: G400 is equipped with cardguides that support 400-mm length PCBs. * Contact us for changes to the reference position. 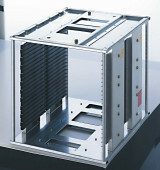 Center stopper is used to accommodate up to 200 PCBs (for widths from 30 to 100 mm). Compatible with M-size loaders and unloaders. Unparalleled delivery performance with superior accuracy and quality without distortion. Equipped with four guide channels. A center stopper bar can be attached. Store 50 PCBs on one side for up to 200 on four sides. 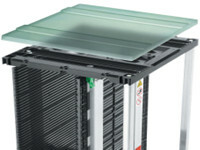 Compatible with all standard NK Cert Series products. Height available at 263, 363, and 463 mm. Because a cardguide’s height is in increments of 100 mm, this magazine can be specified in 100-mm increments. 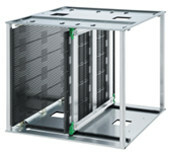 Lightweight and can accommodate storage needs (in 10 slot increments). Available for both quick-width adjustment and screw-bolt adjustment types. Ideal for transportation from mounter to inspection or assembly. Also saves space in storage. Compatible with existing M-size unloaders and enables PCB storage. Saves space for factory storage. 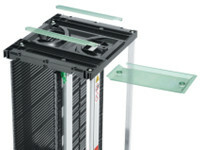 Use two 20-PCBs storage racks. 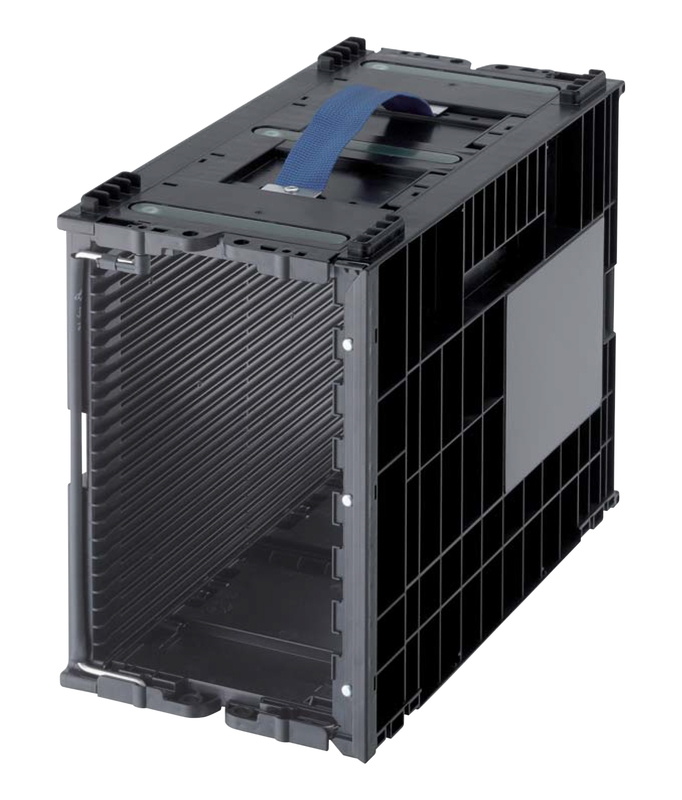 Ideal for storing trays for electronic parts. 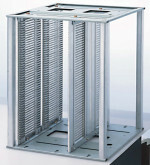 Can also store trays for tray feeders from various SMT manufacturers. Cardguide material is resistant to shaving. All-metal magazine. Cardguides are aluminum or pressed stainless steel. Same specifications as the 0525 Series. Safe for oven and burn-in process. PCBs can be placed in the magazine directly from the reflow oven without cooling down. Same size and reference position as the 0525 Series. Can be used with loaders and unloaders. Space designed between cardguide slots to provide ventilation, thereby allowing consistent heat distribution. Ideal for high temperature ovens. Width adjustment of screw-bolt width adjustment type. 0531, 0539, and 0546 sizes also available.